A witch appears to be screaming out into space in this new image of the Witch Head nebula from NASA's Wide-Field Infrared Survey Explorer, or WISE, released on Halloween (Oct. 31, 2013). It may look wicked, but a stunning — if not scary — new view of the Witch Nebula unveiled by NASA for Halloween is actually the home of baby stars just beginning their cosmic lives. The image, taken by NASA's now-retired WISE infrared space telescope, shows a nebula that bears an uncanny resemblance to a wicked witch in profile, hence its name. 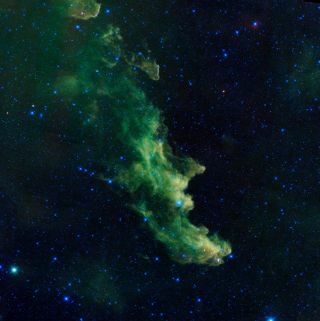 NASA featured the image as its space photo of the day to mark Halloween today (Oct. 31), noting that the nebula witch appears to be "screaming out in space." The Witch Head nebula is hundreds of light-years from earth in the constellation Orion. It can be found near the "knee" of the constellation, NASA officials explained. It's witch-like look is actually an example of pareidolia, in which the human brain recognizes shapes hidden in random images. There are many nebulas in space with a Halloween twist. The Witch's Broom nebula, which is part of the Veil Nebula 1,500 light-years from Earth, is an obvious associate, but there are also nebula's named after wizards and others that resemble ghosts or even a scary flaming skull. NASA's WISE space telescope (the name is short for Wide-Field Infrared Survey Explorer) launched in 2009 on a 10-month mission to map the entire sky in infrared light. The $320 million space observatory completed that mission in 2010 and spent another year searching for near-Earth asteroids as part of an extended mission. The spacecraft was retired from active duty in 2011. Earlier this year, NASA officially revived the WISE space telescope to begin a new hunt for potentially dangerous asteroids that could threaten the Earth. That mission, called NEOWISE, is ongoing.